Envisioning the future is something that we all regularly do. We like to anticipate or forecast the future by creating models and scenarios rooted in the empirical and the critical. Our future outlook in most cases is shaped by our life perspectives, social contexts, and personal experiences. In recent times, however, with the advent of technology, one has to digest vast amounts of information to be able to determine the issues that might shape our individual and collective future. While data and technology is useful, there are other issues that are beyond or outside current paradigms. These may, if properly explored, provide new inputs and could, if applied strategically, transform how we create knowledge, strategy, plans, and budgets. In a world that is experiencing rapid shifts in culture, social patterns and mindsets, the way individuals perceive and interpret the world (worldviews) plays a significant role in strategic development. The inner signals of change and the need to construct a sense of self are an emerging narrative and approach in institutional and personal development. The importance of authenticity, creativity and self-transformation is expected to drive growth in the 21st century. This two day workshop will impart some of the most powerful exploratory devices, concepts, and strategies in strategic futures practice. It aims to capacitate individuals and organizations to explore many aspects of their future. The focus is to enable participants to design their own personal and institutional pathways and enhance their foresight capacities for adaptive response and strategic renewal in their organizations. 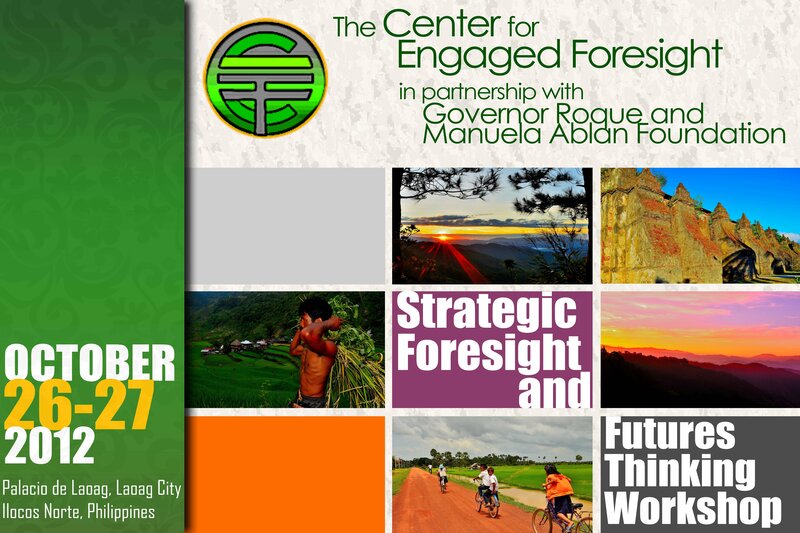 The Center for Engaged Foresight, De La Salle University Manila, Northwestern University, Futures Evocative Australia and the Gogol Project collaborates and happy to invite everyone to join and learn from each other! For inquiries email please email us at engagedforesight@gmail.com or contact us at 0947-963-9858. Thirteen years ago, the 16th World Futures Studies Federation (WFSF) Global Conference the Futures of Diversity: Celebrating Life and Complexities in the Next 100 Years was held in the Philippines. The conference revolved around two themes: the need for maintaining ecological diversity and retain cultural diversity for the survival of the human species (physical, mental and spiritual) amidst the onset of globalization. The event inspired a number of Filipino professors, corporate executives, consultants, community organizers, social activists and cultural creatives to join the WFSF. The Philippines would host the World Futures Studies Federation Secretariat from 1999 to 2002. Cesar Villanueva would serve in the WFSF Executive Committee and was elected to the WFSF board. These were the emergent years of Philippines futures studies. In 2012, I had the opportunity to catch up with Cesar as one of the course directors (the other being Jim Dator) of the futures studies course organized by the WFSF at the Right Livelihood College, Universiti of Sains Malaysia in Penang. Cesar had a lot to say about Philippines futures, “while there were some gains in the past and a resurgence of interest on futures in the Philippines, the country remain pallid when it comes to futures. When compared to Malaysia and Singapore, the Philippines need to do more on this area.” Taiwan, Singapore and Malaysia are now strategic foresight hotspots in the Asia pacific. That day, I tried to scan the web for futures or foresight related events in the Philippines. To my surprise, Cesar was right. I learned that there were only a few articles and foresight events in the Philippines.There was a dearth of academic and industrial researches and papers that employed strategic foresight methods and tools. Alas, I could not find a report, document or essay published on a major or minor journal, or presented in a conference, government reports, blogs, etc. authored by a Filipino futurist on the net. There might be some articles or presentations out there but these may not have not been posted or shared online. The lack of a Philippine futures portal or a local based blog sites and websites, the lack of a futures literacy and education, I assume, might have restricted Filipinos access to and interest in strategic foresight. The absence of a futures community or a Filipino futures discourse was apparent. Sohail Inayatullah’s essay entitled Alternative Futures in the Philippines written in the 1990s is an excellent read. It mapped possible, plausible and preferred futures in the Philippines. Tony Stevenson’s essay entitled Courage and Resilience: Creating Filipino Futures is also a must read. Stevenson explored the past, present and democracy futures in the Philippines. The typhoon was used as a metaphor to encapsulate the Philippine experience to democracy and alternative futures. Cesar Villanueva’s unpublished paper entitled Beyond Typhoon and Earthquakes: An Eagle’s Eyes of the Futures of Asian Development and Cultures is highly recommended. The article entitled “Futures Thinking” written by Florangel Rosario Braid urged Philippine public and private sectors to integrate futures thinking in management and decision-making. As I deepened my search, I was lucky to find Geert Hoffstedes’ research on long-term orientation. Hoffstede analysis argued that Filipinos were primarily short-term than long-term oriented. Hoffstede, a social psychologist, had the values of persistence (perseverance), the ordering of relationship by status, thriftiness, and having a sense of shame as long-term oriented values. These values according to Hoffstede are future oriented, pragmatic and more dynamic. Society’s that slopes towards the values of personal steadiness and stability, protecting your face, respect for tradition and reciprocation of favors, greetings and gifts were short term oriented. These values according to Hoffstede are geared towards the past and the present, hence, were more static, inert, or unchanging. The Philippines was placed in the category of countries with high short-term orientation. China, Taiwan, Singapore, Japan and South Korea were considered societies with high long term orientation. The deep conversations I had with Jose Ramos and constant email exchanges with Sohail Inayatullah, Cesar Villanueva, Stuart Candy, Anwar Fazal and MeiMei Song solidified my plan to establish the Center for Engaged Foresight (CEF). In this vein that the CEF organized the first Philippine course on futures thinking, public policy and strategic foresight. Jose Ramos, a senior consulting editor at the Journal of Futures Studies and professor at the National University of Singapore and I course directed and facilitated the workshop. It had two objectives: 1) To introduce futures thinking and strategic foresight methods and tools; 2) Explore Filipino alternative and preferred futures. These issues were known through the process of “speed dating”. In the speed dating activity, participants were requested to identify and write in a sheet of paper at least two major issues they considered as “wicked problems”. Wicked problems are problems that are by nature difficult to solve due to the complexity of the problem (its multidimensional or strangulated causes makes it difficult to resolve). The participants were asked to find a partner interested on a similar issue or with the same wicked problem in mind. The partners worked on their issues and applied different foresight techniques and methods to unpack the causes and solutions. 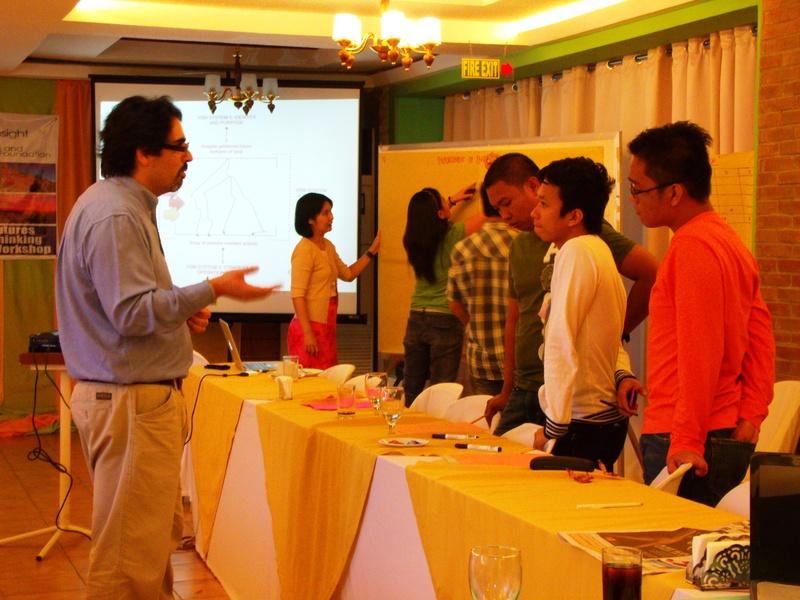 Applying the emerging issues analysis and double-variable method to scenario building, the group explored the possible, plausible and preferred Philippine democracy futures. The issue was political dynasty. The background was that politics in the Philippines has been under the control of few notable families. It has been regular or perhaps normal in the Philippines for a politician’s son, wife, brother, sister and relatives to run in the same office and assume other government offices (appointed or elected). This wicked problem was the day’s news headline and the news reported that civil society groups, people’s organizations and academics urged the congress to legislate an anti-political dynasty law. Table 1 is a synopsis of the group output on Philippine democracy scenarios with political dynasty as the wicked problem. A more in-depth exploration of Philippine Democracy futures will be presented in a separate article. 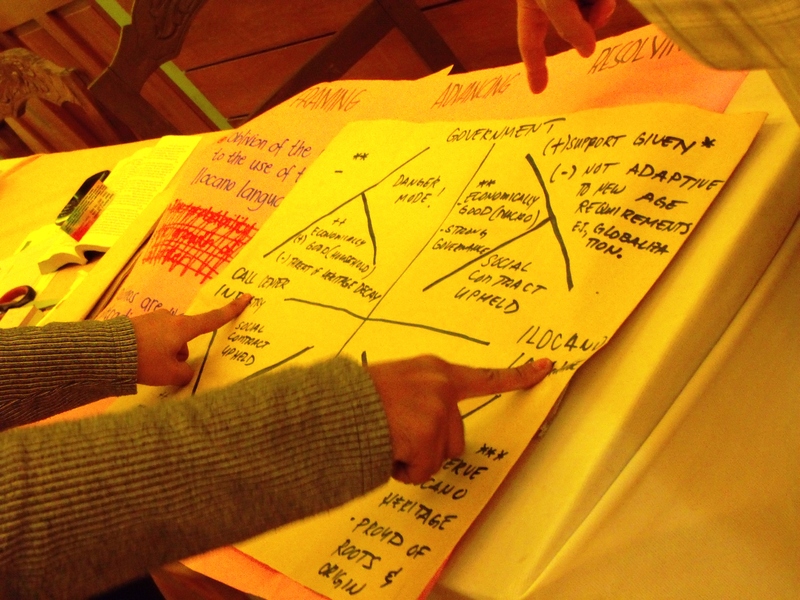 Corruption and weak governance was the second wicked problem explored by the participants. As a group, it employed causal layered analysis to deconstruct the causes and solutions to corruption and weak governance. The context was the Philippines ranked as 129th out of 183 most corrupt countries in the world by the Transparency International. The corruption perception index slightly improved from 134th last year. The improve ranking was attributed to President Aquino’s Anti-Corruption agenda. The TI survey looks at factors such as enforcement against anti-corruption laws, access to information and conflicts of interests (Horacio, 2011). The table below is a summary of the group output. The group that worked on this issue will do an in-depth exploration of causes and solutions using CLA as a method. Table 2 is a summary of CLA workshop on Philippine corruption and alternative governance futures. The third group consisting of academics, pollution control officers and environmentalists identified environmental protection and management as the third wicked challenge. They employed a variety of futures tools to explore its futures. But in this article I will present only the group’s initial output using the cross impact analysis to scenario development as a method. A more thorough exploration will be presented in a separate article. 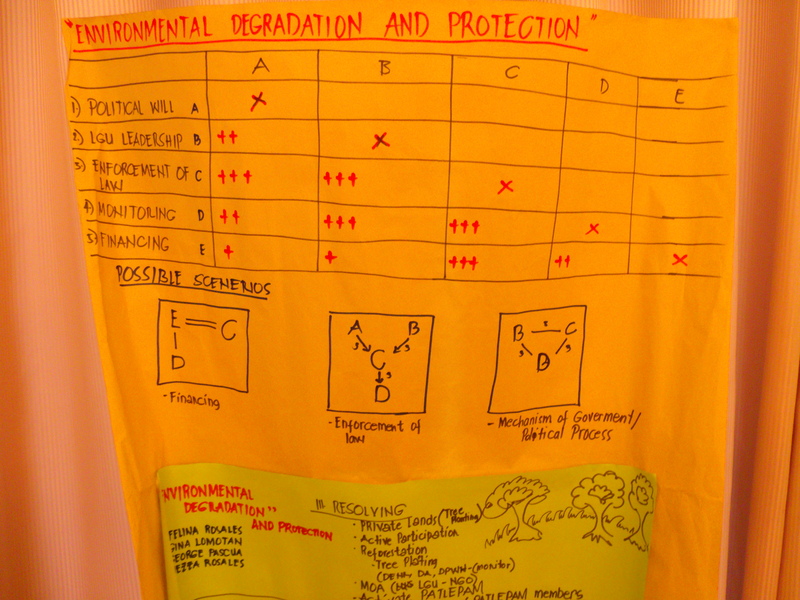 The group identified at least five key variables that drives the future of environmental protection and management in the Philippines at the local government level. These are: (1) political will; (2) LGU Leadership; (3) Enforcement of Law; (4) Monitoring; (5) Financing. 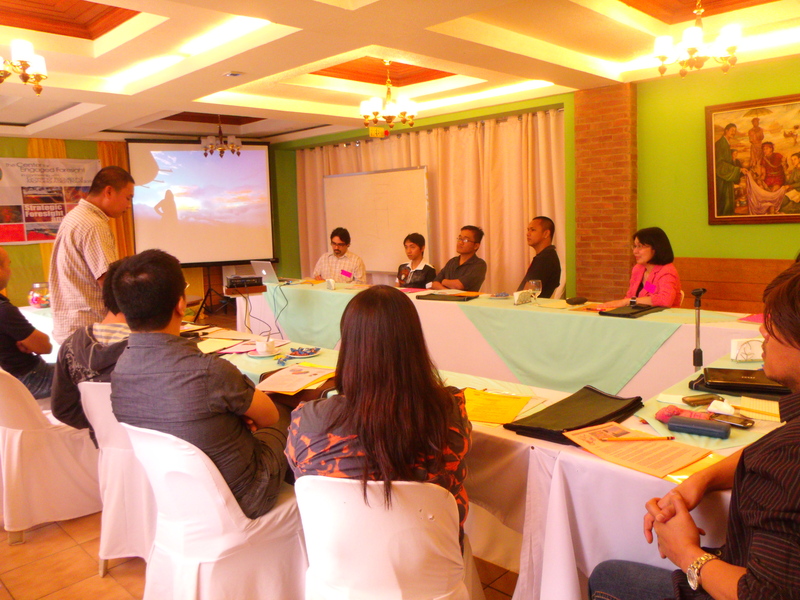 The cross impact analysis was selected by the group to explore and unpack a better scenario considering the uncertainty or wickedness of environmental degradation in the Philippines at the local government level. The figure below is an example of scenario making using cross-impact analysis as a method. 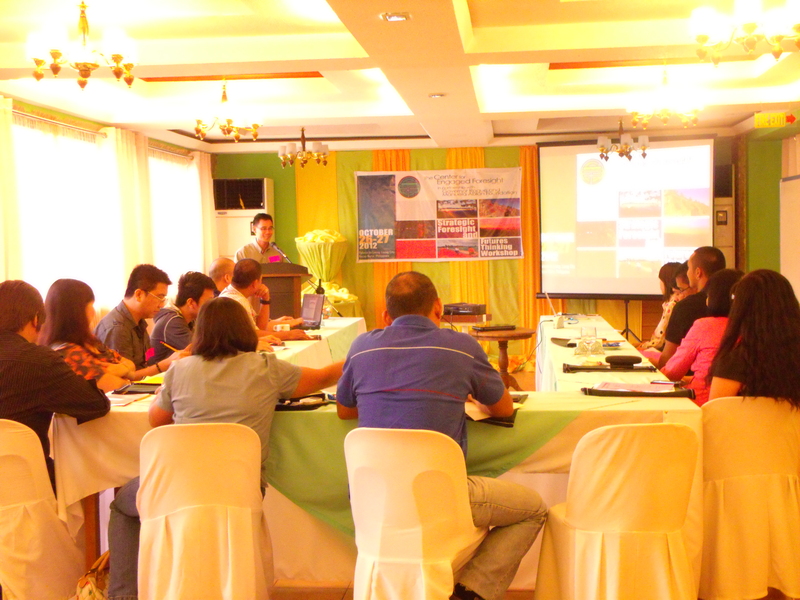 The group assumed that law enforcement has a strong correlation to political will, LGU leadership, monitoring and financing. The law enforcement variable appeared as the most significant variable in all the variables identified. In fact, the intensity of law enforcement at the local government level defines the nature of political will and LGU leadership and the efficiency and effectiveness of monitoring and financing in environmental protection and management at the local government level. Moreover, monitoring is strongly correlated to LGU leadership and enforcement of law and financing is strongly related to enforcement of law. On the other hand, financing has a weak correlation to political will and LGU leadership as far the groups’ experiences (as academics, chairman and members of mining boards, as engineers of a mining firm, as a local government official, as an NGO participant) were concerned. The outputs, however, require further examination and the scenarios emerging from these relationships will be presented in a separate article. The fourth wicked problem that participants identified was the tension between the need to preserve and strengthen the Ilocano language, the English only language policy and the demand of the call center industry. Using cross-impact analysis as a method, different scenarios emerged. These are: Danger mode – the Ilocano language is under threat and so is the Ilocano heritage. While the government supports the use of the Ilocano inside the classroom (primary and secondary schools), most higher education institutions, however, implement an English language only policy. The view was that English was all about global competitiveness and that call center industries demand a more English proficient work force in the Philippines. In short, the economic value of the English language informs tertiary education policies, Philippine industry and labor policies. 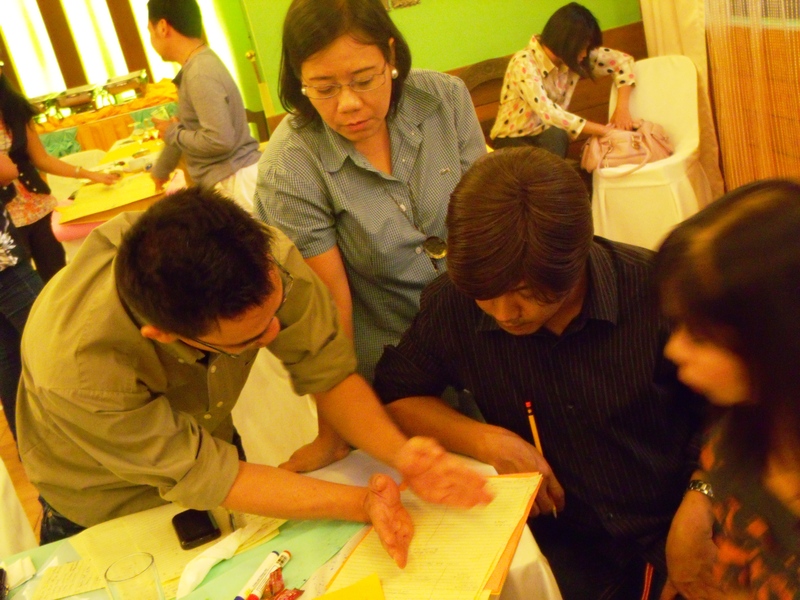 More scenarios were unpacked by participants when foresight methods were applied on the issue. The underlying core message or question was how might we respond to the transformation of local language, education and labor demands for a better tomorrow (language, policy, industry) was the aim of the investigation. 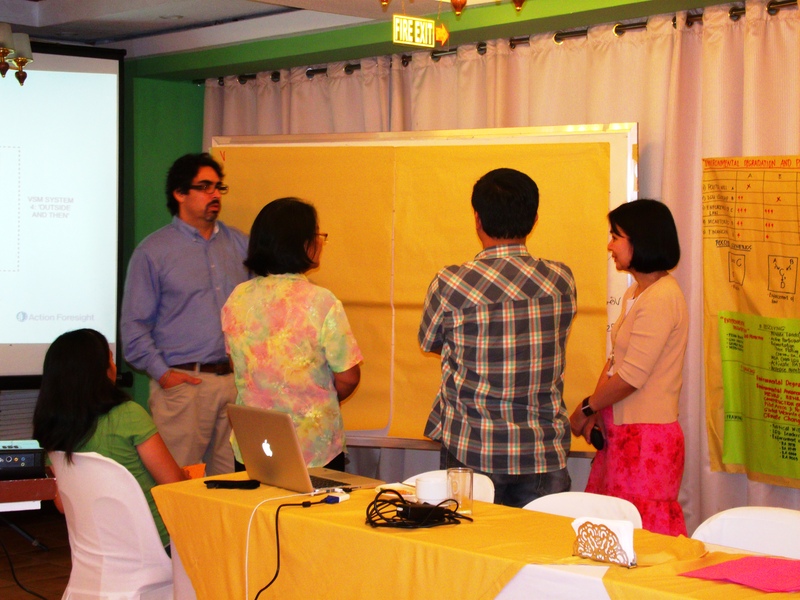 The strategic foresight workshop was, I think, intensive and engaged participants to explore plausible and preferred Philippine futures. Issues like the family affair democracy system, corruption, environment and language were the wicked problems and traumas of the present. These traumas needed an antidote, they said. The participants sincerity to explore alternatives and transformative futures were indicative of their hard-wearing optimism. The option to act and engaged at different levels (personal, community, government, corporate, etc.) of “people power” was needed they argued. Shermon Cruz. 2012. Workshop notes on Strategic Foresight and Futures Thinking Workshop, October 26-27, 2012, Palacio De Laoag, Ilocos Norte Philippines.